WASHINGTON (CNN) -- Senate Finance Committee Chairman Max Baucus on Tuesday unveiled changes to his compromise health care proposal intended to alleviate the concerns of fellow Democrats as the panel began debating more than 560 proposed amendments to the measure. (L-R) Sens. 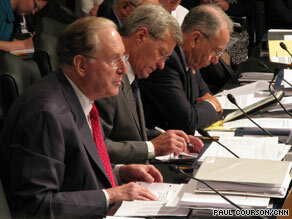 Rockefeller, Baucus and Grassley listen to testimony Tuesday from experts on health care costs. The proposal is considered the only one before Congress capable of gaining Republican support for President Obama's top domestic priority. Baucus, D-Montana, began the committee hearing Tuesday by telling his colleagues that they have the chance to "make history" with legislation to overhaul the nation's ailing health care system, affecting every citizen and one-sixth of the U.S. economy. "Our actions here this week will determine whether we are courageous and skillful enough to seize the opportunity to change things ... for the better," Baucus said. "No one should die because they cannot afford health care. This bill would fix that." "Every 30 seconds, another American files for bankruptcy after a serious health problem. Every year, about 1½ million families lose their homes to foreclosure because of unaffordable medical costs. No one should go bankrupt because they get sick. This bill would fix that," he said. The changes Baucus incorporated after meeting Monday night with Democratic committee members would increase, by $50 billion, government subsidies to help low- and middle-income families afford health insurance. Baucus offered his plan after months of negotiations with three Republicans and two other Democrats on the committee in talks labeled the Gang of Six. However, none of the three Republicans in the negotiating group has backed the Baucus proposal. What's in Baucus' health care proposal? The committee hearing is expected to last all week to deal with the multitude of proposed amendments, many of them by Democrats looking for ways to make health coverage more affordable. It was not immediately clear whether the changes from Baucus would result in some of the Democratic amendments being withdrawn. Republicans have put forward amendments seeking to reduce additional taxes and fees in the proposal. Sen. Orrin Hatch, R-Utah, proposed an amendment that explicitly exempts families that make less than $250,000 per year from tax increases in the bill. Hatch said the amendment matches the rhetoric of Obama, who repeatedly has promised not to raise taxes on families making than $250,000 a year. Sen. Charles Grassley of Iowa, one of the Republicans in the Gang of Six talks, offered several amendments to kill nearly $10 billion in excise taxes on the insurance industry, medical device manufacturers, clinical laboratories and manufacturers of imported brand drugs. Another Republican senator, John Ensign of Nevada, seeks an amendment to change the word "fee," used throughout the Baucus proposal, to "tax." Democrats have offered other measures that highlight the controversies and differences in their own party. Sens. Jay Rockefeller, D-West Virginia, and Charles Schumer, D-New York, both introduced amendments to include a government-run public insurance option in the Baucus plan. The public option is favored by Obama and most Democrats as a necessary competitor to private insurers to hold down costs. Republicans unanimously oppose the public option, calling it an unfair competitor that would drive out private insurers from the market and bring a government takeover of health care. Democrats reject the claim as misinformation, but the issue has become the most hotly debated provision of an emotional debate that included heated town meetings across the country during the congressional recess in August. Baucus dropped the provision from his proposal amid indications that a bill with a public option would lack enough support for Senate approval. In a possible compromise, moderate Republican Sen. Olympia Snowe of Maine, another of the Gang of Six negotiators, has offered an amendment for a "trigger" mechanism that would require the creation of a public option in the future if market reforms fail to bring greater competition and lower costs for consumers. Four other health care proposals, all by Democrats, have passed congressional committees: three in the House and one in the Senate. CNN's Dana Bash contributed to this story.